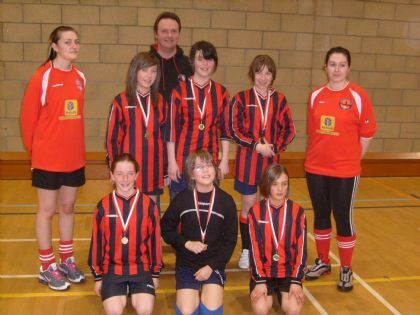 Following a successful two nights of coaching held by Orkney Women’s Football there was sufficient interest from girls aged 9-15 to allow a number of girls only teams to participate in the OYDG competition held on 8th and 9th September 2012. Two primary girls teams played each other and three secondary teams (two from Stromness and one from Kirkwall) competed in a round robin tournament. All the girls enjoyed the matches and the pick of the teams was the Kirkwall secondary girls side which won both of their matches against Stromness A and Stromness B. A number of the secondary girls looked highly capable of making the step up into the Orkney Women’s team in future years which will be a major boost. It is hoped that with the level of interest shown this will lead to all girls tournaments in the future. 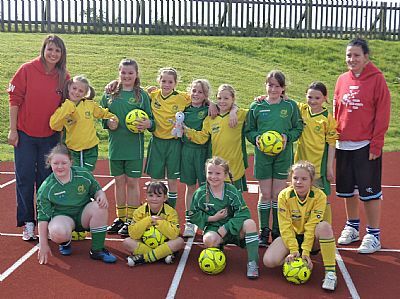 Charlotte Milne who organised the coaching said “Orkney Women’s Football were delighted to be able to provide a much needed opportunity for young girls in Orkney to take part in a girls only tournament. It was especially pleasing to see that the girls that took part showed a lot of ability and enthusiasm. Hopefully the success of this first tournament will lead to further coaching events and tournaments being established. We are planning to meet with the secondary schools, local coaches and OYDG to decide how to bring this forward and will put future training and tournament opportunities on the both the OYDG and Orkney Womens Football club facebook Page. Can I also take this opportunity to thank all the female coaches who volunteered their time over these sessions they did a fantastic job! 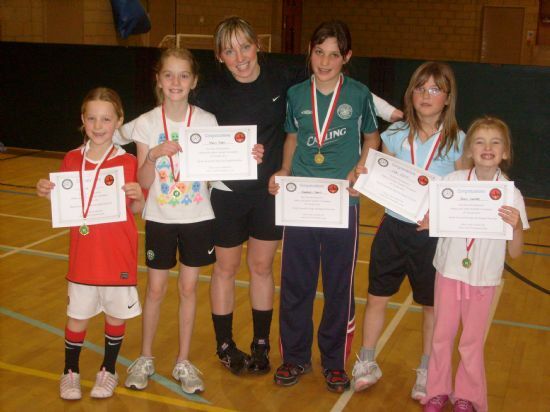 OWFC are hoping to put 11 more ladies through their Level 1 coaching qualification in the coming months”. 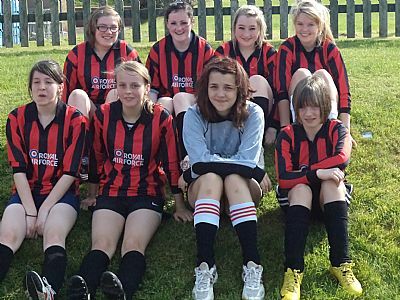 Orkney Women’s Football Club supported by Orkney Youth Development Group are looking to provide opportunities to develop girls only football in Orkney. As a first step the Orkney Women’s Football Club are running 2 weeks free training with qualified female coaches for girls aged 9 – 15. Training sessions will be held on Wednesday 29th August and 5th September 2012 between 6.30 and 7.30pm at the Pickaquoy Centre outfields. It is hoped that there will sufficient numbers of girls showing an interest in training to enable a number of girls only matches to be played during the OYDG club competition which takes place at Picky on Saturday 8th and Sunday 9th September. To register your interest and for further details please contact Charlotte Milne on 01856 878336 or e-mail Charlotte at charlottemilne@btinternet.com. 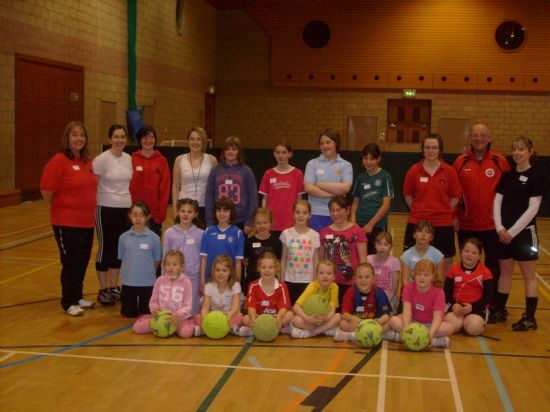 Eighteen Primary 4-7 girls took part in a fulll day of football at the Picky Arena on Sasturday 16th October. The emphasis in the morning was on coaching with the girls being put through their paces by the Orkney Womens Football Club. The football finished with the combined teams (The Fluffs/The Competition) beating (Inittowinit/Extremers) by 5 goals to 4 in an exciting match with all the players participating in a 9-a-side match. At the end of the day Jim Cormack OYDG Chairman congratulated the players and thanked Charlotte Milne and the Womens Football team plus the referees for helping to make the day such a success. Certificates were then awarded to all the players and the winning team was presented with medals. OYDG's first ever competition for girls was played on Saturday 13th March at Picky. There was plenty of drama in front of a large and noisy crowd. 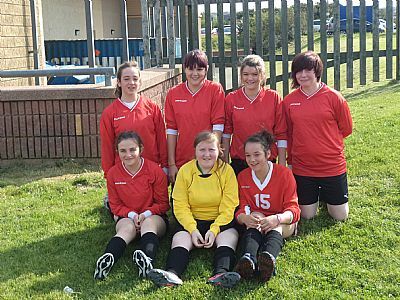 The one-off competition organised with assistance from Orkney Women’s Football resulted from a Youth Football Summit last November which identified the lack of opportunities for girls football as a major issue. Four well matched teams - Glaitness, Dounby, Stenness Lassies and Firth Swifts contested the semi-finals which proved to be highly exciting and tense matches. The first semi-final was a tight affair with a very late equaliser by Dounby after Stenness Lassies had taken the lead. Both teams came close in extra-time but good saves by the respective goalies prevented further scoring and the game went to penalty kicks. The game was eventually won 5-4 on penalties by Stenness Lassies but only after both teams had to return to the pitch to continue their penalty shoot out after it was discovered that there had been an unfortunate error in scoring the initial contest. This was hard luck for a Dounby team who had initially thought that they had progressed to the final. The second semi-final was equally exciting with Glaitness edging out Firth Swifts by 3 goals to 2 in an end to end thriller. Prior to the final the 3rd/4th Place Play-off match was played and a tight game between Dounby and Firth Swifts ended 1-1 after extra-time. Credit to Dounby who held their nerves to win the shoot-out 5-4 and clinch third place. In the final Stenness Lassies opened up a two goal lead and although Glaitness pulled back a late goal, the final whistle blew with the Stenness girls emerging victorious and winners of the competition. Glaitness can consider themselves unlucky having hit post and bar during the game but in the end the Stenness girls probably just deserved to win the competition. In doing so they have matched the success of Stenness Falcons in the boys competitions proving there is plenty youth football talent in this part of Orkney. In the competition for the older girls Orkney Women’s A team came out on top in a closely fought and very competitive group. Pick of the matches was a 2-2 draw between Orkney A and Sanday. Addressing the crowd at the end of the competition Jim Cormack, Chairman, OYDG congratulated the girls on the excellent standard of football they had played. He remarked on how this new competition had caught the imagination of the Orkney media and public and he hoped it would provide the necessary boost to girls football that would allow it to be taken more seriously in the future. Winners medals were then presented to the Stenness Lassies by Amy Peace and Caron Bews from Orkney Women Football. 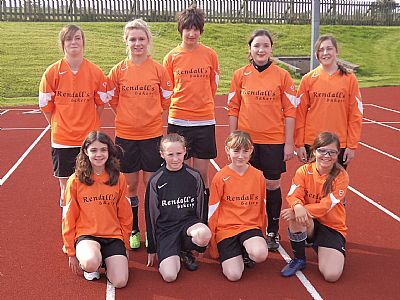 All in all an excellent nights football which was thoroughly enjoyed by girls and spectators alike. The success of this one-off event has proven that there is sufficient interest in a regular indoor competition for girls and it is hoped that sufficient volunteers can be found to establish girls football on the indoor football scene.